Precursors to the Mamluks, the Ghulams are soldiers largely drawn from African slaves. Trained and kept at their "master's" expense, these soldiers are given their freedom once they reach a certain standard and are kept on as their "master's" personal guard. 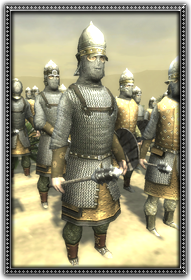 Ghulams are well trained and protected by heavy mail and equipped with a mace.